Sarah from Australia went overseas at the age of 18 and since then she has caught the travel bug. 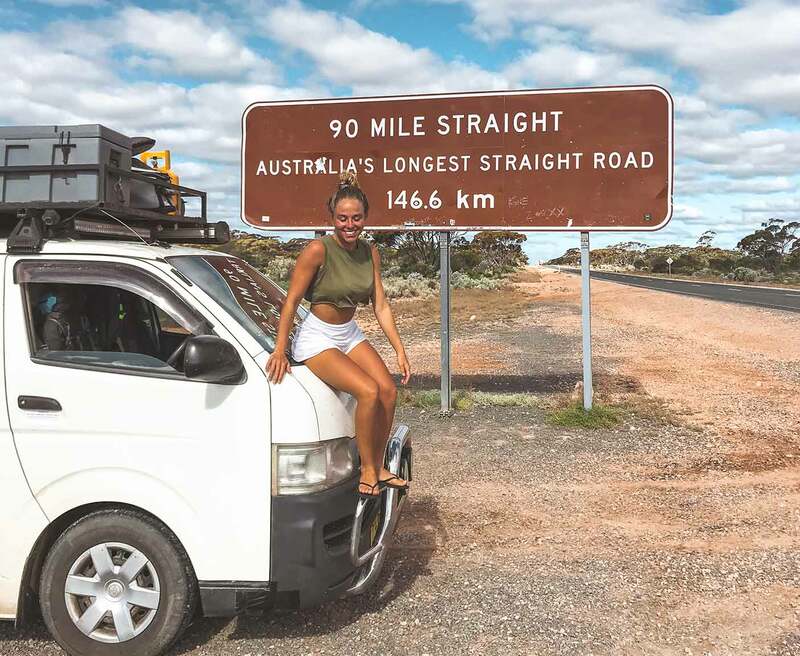 With her Toyota Hiace van she is traveling around Australia. Next stop ASIA. 2 HEY Sarah! Tell us a bit about you first! 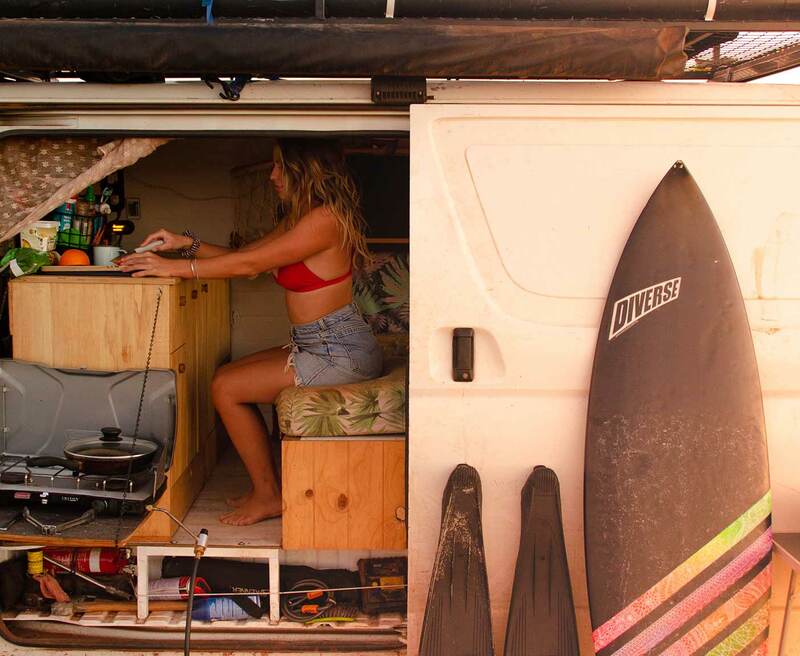 3 Why did you choose the Toyota Hiace as your home on wheels? 4 How long are you on the road and what did you do before that? 5 Did you work on your vehicle yourself or did you get a carpenter for the interior? 6 Do you sometimes wish you would have more space in your home on wheels? 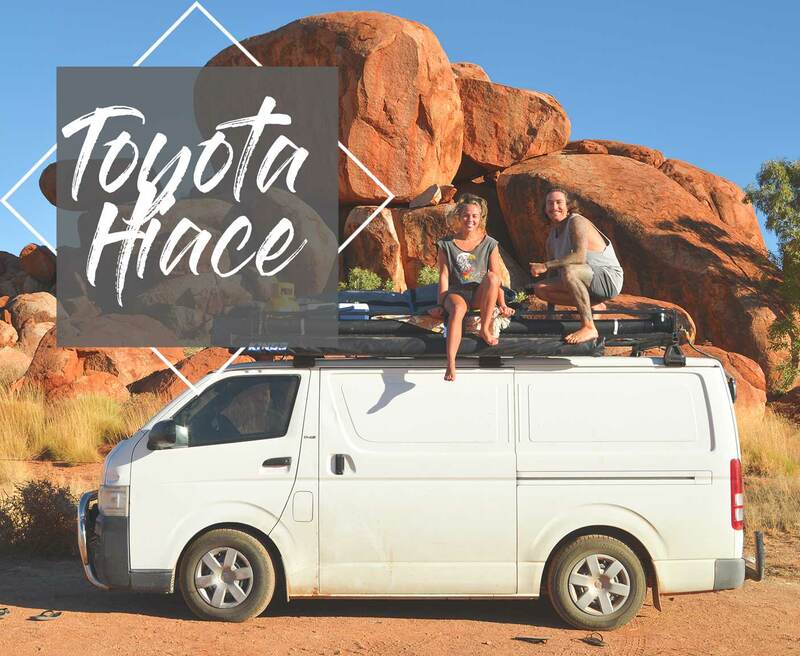 7 How long did you work on your Toyota Hiace before you started your trip? 8 Tell us what you love about vanlife. 9 Which countries did you travel to with your vehicle? 10 Do you prefer Free Camping or Camping Grounds? 11 What´s the longest road you drove? 12 Do you meet other vanlifers sometimes? 13 Is there something you don´t like about vanlife? 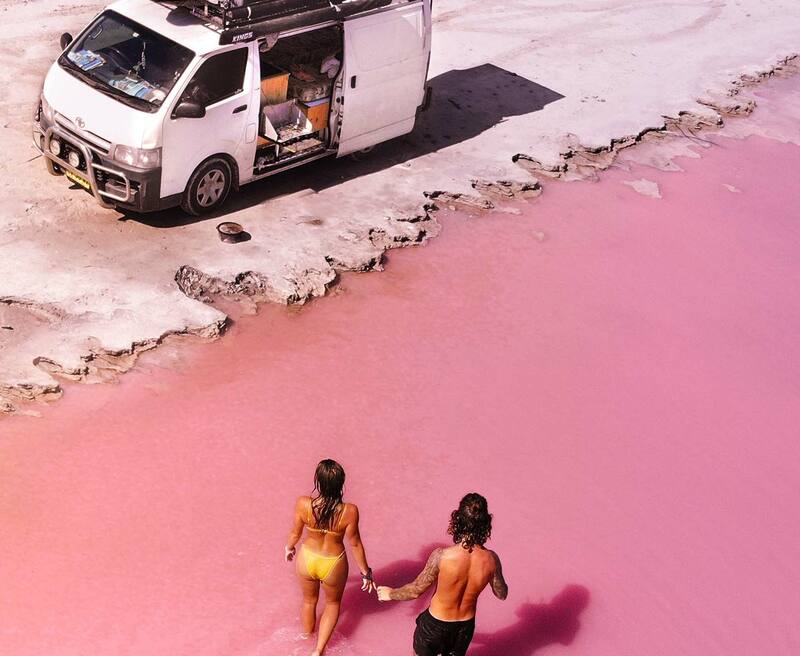 14 What makes travelling and living in a van such a great experience? 15 Do you work online while traveling? 16 Tell us your future plans! vehicle taxes: Vehicle taxes would just be your rego each year, green slip and pink slip ( things you need to pass rego ) and compulsory third party insurance. HEY Sarah! Tell us a bit about you first! I’m a 22 year old Aussie, I was born in a beautiful small country town called Bowral. I first went overseas at the age of 18 and since then have caught the travel bug. I’m a massive water baby, so love the ocean and hope to become a paramedic in the near future. Why did you choose the Toyota Hiace as your home on wheels? We previously wanted a larger model but due to our budget we’re unable to do so, we always wanted Toyota as they’re a very reliable and well known brand. This model really suited our needs as we realised we didn’t really need much to be happy travelling around Aus. How long are you on the road and what did you do before that? We’ve been on the road now for 6 months, and have no real time limit, we just work when we need to and then keep rolling on. Vin was a previous diesel mechanic and we both worked as bar tenders. Did you work on your vehicle yourself or did you get a carpenter for the interior? Everything was done by Vinnie, myself and our good friend Andy who is a carpenter by trade. We both really got in and tried to help and do as much where we could. Vinnie is very handy with tools and with our friends guidance the inside of the van was built. Do you sometimes wish you would have more space in your home on wheels? You definitely get times where you’ve had enough of being in such a tiny space, especially when the weathers rubbish ! But we’ve learnt that we appreciate the little things much more now that we live in a tiny rolling home hHa. Of course more space would be wonderful but we don’t feel like we need it. How long did you work on your Toyota Hiace before you started your trip? We took it pretty slow building our old gal, it took us about 9-10 months just because we were also working a lot to save money. Tell us what you love about vanlife. I love having our home with us everywhere we go, we get to a new spot and bam you’re set up and ready to have lunch or just go off and explore, there’s not a lot of thought to it, takes the stress of packing and risk of forgetting things out of the picture. I love just by having a camper the community and friends we’ve been able to make, it’s such a large community vanlife and it’s so awesome to be apart of. Which countries did you travel to with your vehicle? We’ve currently just done Australia in our van, however we would love to take her overseas or perhaps do a build in another country and travel around Europe, USA or New Zealand would probably be the places we’d choose from. Australia definitely is our favourite country haha ! We’ve back packed around Europe for 3 months and I’d have to say we still love Australia as our number one country. Do you prefer Free Camping or Camping Grounds? We like to mix it up, we call it “ stealth “ camping when we’re camping in an area that doesn’t have any designated camping. We definitely prefer the free camps or camping out of populated areas, we like to be in open spaces and where’s it quiet. What´s the longest road you drove? The longest road so far would have to be crossing from QLD to the NT but this will soon be second as we’re about to do the Nullarbor plain which Is 1256 km. Do you meet other vanlifers sometimes? We do ! Mainly on the easy coast of Australia, there is a lot of vannies around, the west is a lot further and we haven’t met as many. 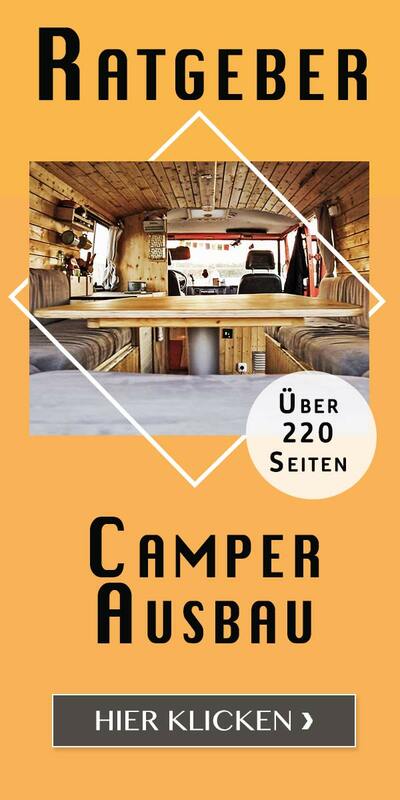 Is there something you don´t like about vanlife? Yess ! Ahha i particularly get annoyed at the amount of unwanted attention a van can generate, we get a lot of people starring in and not really liking the van life community for some reason. We’ve had some bad experiences with locals targeting us because we’re in a camper van. What makes travelling and living in a van such a great experience? I get really happy when I think about all our crazy and amazing experiences that our Toyota Hiace of ours has taken us on, all the rough dirt tracks and river crossings and all the disasters. Do you work online while traveling? We don’t, we’re currently working Vinnie as an arborist and myself a lifeguard. We’re both really outdoors kinda of people. Tell us your future plans! Currently it’s to finish our lap of Australia so we still have a long way to go we’ve got the rest of SA, the middle of the NT, VIctoria, Tasmania and then the NSW coast again. After this we’d love to do New Zealand or a south east Asia trip !